Google's latest Nexus devices set a new standard for how good Android can be -- and how much a standout smartphone should cost. Nexus phones present a strange duality. To Android enthusiasts, they're the most buzzworthy devices of the year. And for good reason: They're the flagships of Google's Android platform, carefully crafted to show off the latest software and services -- and they get speedy ongoing updates directly from Google itself. To most average Joes, though, Nexus phones are -- well, practically nonexistent. Most typical smartphone shoppers have never even heard of 'em. And it's no surprise: Google hasn't done much to market the things and they've rarely been sold in any prominent places. They've been mainly the phones for people in the know. This could be the year that changes -- or at least, maybe the year it should. For the first time, Google is selling not one but two Nexus phones: the small and understated 5.2-in. LG-made Nexus 5X and the large and premium 5.7-in. Huawei-made Nexus 6P. The phones are more focused than ever on delivering well-rounded experiences, not just with software but also in areas like photography, where past models have struggled. Google's been advertising the phones aggressively, too, with primetime ads popping up in places like Sunday NFL games. And while the phones are being sold only through Google's and Huawei's online stores, their values are hard to ignore: The 5X starts at $379 and the 6P at $499 (though the latter is frequently showing as out of stock on Google's website and currently available only as a pre-order at Huawei's). They're both unlocked and compatible with any U.S. carrier (including Google's unusual new multi-network Project Fi service) -- something you won't find with the $700 to $800 flagship phones that are far more common in this country. After spending the past couple weeks alternating between the two new Nexus devices, I'd say the question isn't whether one of them is worth buying. It's whether you can still justify spending money on any other Android phone. The question isn't whether the Nexus 5X or 6P is worth buying. It's whether you can still justify spending money on any other Android phone. Like past Nexus devices, the Nexus 5X and 6P were designed with close involvement from Google's Android team. Consequently, they share a lot of DNA -- but even so, these two smartphones couldn't be more different in form or feel. The 5X measures in at 5.8 x 2.9 x 0.31 in. -- dimensions that feel downright tiny by today's Android flagship standards. The device fits naturally in the hand (even in a relatively small mitt like mine), and its light 4.8-oz. weight makes it incredibly comfortable to hold and carry. If you're like me and have yet to be wooed by the giant phones that dominate the current mobile landscape, you'll appreciate that extra manageability. I'm coming from a 2014 Moto X, and even though the 5X is a touch taller than that device, it's about the same width and noticeably slimmer. It feels more svelte, in both my pocket and my hand -- and the 2014 Moto X was already quite comfy for me. The Nexus 5X is by no means a premium device, but it doesn't come across as cheap, either. The phone has a solid matte-plastic back -- available in black, white or light blue -- and it seems sturdy and well-constructed. The plastic material has a nice warm feel to it that further adds to the comfort factor. The other Nexus is a different story. Where the 5X is small and modest, the 6P is large and luxurious: 6.3 x 3.1 x 0.29 in., with a gorgeous black, white or silver-colored aluminum casing. The result is a phone that's less warm and inviting, and more sleek and futuristic. It feels carefully crafted and thoughtfully designed. Even the power and volume buttons are made of metal -- a noticeable contrast to the more subtle and recessed plastic buttons on the 5X. It's clear within seconds of picking it up that the 6P is the premium option of this pair. The Nexus 6P is most comparable in size to Samsung's Galaxy Note 5. Like the latest Note, it's just small enough to be reasonably manageable, even for a big-phone holdout like me. "Reasonably" is the key word there: The 6P's height does make it a touch too tall for comfort at times, like when I'm at the gym and find myself shifting the phone around in my pocket to keep it from falling out. And unless you have freakishly long thumbs, using it one-handedly requires some awkward palm-maneuvering in order to reach the screen's farthest edges. These are typical tradeoffs of a plus-sized phone, though -- and as far as that category is concerned, the 6P really isn't that bad. While the 5X is more ergonomic, I've found I get used to the 6P's frame pretty quickly. Once I've had it with me for a few minutes, I usually stop thinking about its size. If you're wondering why you'd want to bother getting a larger and less ergonomic device, the most compelling reason resides in the display: The 6P's screen is a stunning 5.7-in. WQHD AMOLED panel that's among the finest you'll feast your eyes on today. It's bright, crisp and clear with delightfully deep blacks and richly saturated colors. It's a true treat to view and it'll spoil your eyes for anything less spectacular. And that's where spending time with the two Nexus models together is both enlightening and frustrating: The 5X's 5.2-in. 1080p LCD screen is actually really good for its class. It's razor-sharp, bright as can be and just as easy to see as the 6P's display in even the glariest conditions. If you were using only the 5X -- the way most people who buy a new phone would -- you'd probably be thrilled with the quality of its screen and wouldn't spend a second of your time second-guessing it. When you view the two phones together, though -- or move back and forth between them, as I've been doing these past several days -- the 5X's panel looks noticeably muted and less vibrant in its coloring. It sometimes even appears a little washed out next to the 6P's punchy nature (a common criticism of LCD panels compared to modern AMOLED displays). The difference is especially apparent with blacks, which are kind of grayish on the 5X -- almost like someone took the 6P and cranked the contrast level way down. Here's a little secret, though: As a normal single-phone-using person (not a weird minutia-obsessed reviewing robot like, ahem, some of us), there's a good chance you won't notice or care about this level of detail. For perspective, I showed my wife the two phones together and pointed out what I just described about the displays. While she could certainly recognize what I was talking about, she didn't find it meaningful or relevant -- and in fact, she ultimately decided she preferred the 5X for its size and feel. So the importance of this is really all relative to your preferences and priorities. Both new Nexus phones have a Motorola-inspired feature called Ambient Display that's supposed to show the time and any pending notifications on the screen whenever you pick up or "nudge" the device. The movement-dependent parts of the feature don't work consistently or quickly enough to be useful, but the screen does light up briefly anytime a new notification comes in -- which can be beneficial when your phone's sitting on a table in front of you. It's more suited to the 6P's display than the 5X's (see my 2015 Moto X review for a technical explanation), but it's nice to have on both devices. Each new Nexus phone also has an old-fashioned notification LED if you'd prefer that kind of visual alert; you just have to go into the system settings to enable it. One other distinction worth mentioning is in the realm of audio, where the 6P holds an undeniable advantage with its dual front-facing speakers. The phone's audio is loud and clear, though somewhat on the tinny side. It's leaps and bounds ahead of the 5X, which has a single front-facing speaker that's serviceable -- but not much more than that. So basics aside, what are the new Nexus phones actually like to use? In a word, delightful -- the type of cohesive end-to-end experience that's hard to find on Android devices. The reason is simple: Nexus phones use a pure and unadulterated version of Google's Android operating system, and their hardware is designed specifically to complement that setup. Android has matured into a polished and attractive platform, more so than ever with the new Android 6.0 Marshmallow release -- but with the way most manufacturers muck up the software, you wouldn't ever know it. Companies like Samsung and LG work hard to establish their own ecosystems within the Android ecosystem, baking in redundant services and arbitrarily changing visual elements to create a "differentiated" look. The result is a confusing mess of overlapping options and conflicting styles, and it tends to be tolerable at best -- but neither intuitive nor particularly pleasant to use. It's more about the manufacturer's needs than the user's (and don't get me started on all the garbage that carriers add into the equation). With the Nexus 5X and 6P, you get a pristine version of Google's core vision for Android. It's refreshingly clean, light and easy to use, with no superfluous clutter and a consistent design language that extends from the system UI to the ecosystem of apps around it. The diversity stemming from Android's open nature has been critical to the platform's growth and success -- but at this point, a holistic package with a single unified vision simply makes for a better user experience. Also adding to the experience is the upgrade situation: Unlike most Android devices, which rely on their manufacturers for software support -- often resulting in maddening delays and disappointments -- Nexus devices receive updates directly from Google. That means when Google gloats about a fancy new feature or fix, you'll actually get it on your device -- and usually within a matter of days or weeks. No other type of Android phone offers that level of consistency and reliability. 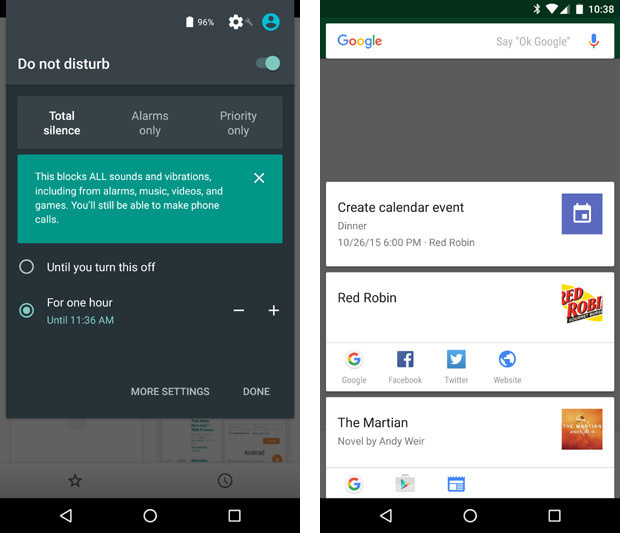 Marshmallow in its current form isn't a dramatic departure from the Android 5.x Lollipop releases that preceded it, but it adds some important refinements and new functionality. One of the most noticeable adjustments is the software's ability to more intelligently manage power consumption -- something that allows both Nexus phones to sit idle for hours and barely lose any juice. The new Do Not Disturb setup and Now on Tap. The Nexus 5X and 6P also support always-listening voice control: Once you've trained your phone to recognize your voice, you can just say "Okay, Google" -- whether the screen is on or off -- and then ask questions or issue commands. It can really come in handy when you're driving or at home, though the option to enable it is strangely buried deep within the system settings. Some sort of prompt following the phone's initial setup procedure would be helpful; as it stands now, I suspect many users won't ever realize the function is available. 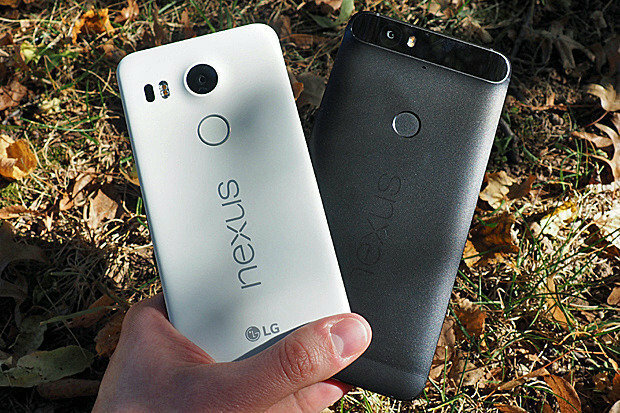 Nexus 5X vs. Nexus 6P: Which do you want? 5.8 x 2.9 x 0.31 in. 6.3 x 3.1 x 0.29 in.